Ministers are backing the idea, but will offer it for consultation before any changes happen. The scheme would reduce greenhouse gases from landfill, but could lead to less frequent collections of general household waste. Some councils will oppose the policy unless they are given extra funds to carry out the scheme. At the moment, only around 35% of households in England are obliged to put food waste in its own caddy. That compares with 56% in Scotland and 100% in Wales. The figures exclude food waste mixed with garden waste. While the new rule would force councils to offer separate food caddies, people would not be obliged to use them. Why do we need food caddies? Unwanted food that goes into a general bin rots in landfill and creates methane - a powerful greenhouse gas. When waste food is collected separately, it can be put into an anaerobic digester - a tank in which the food breaks down into sludge, carbon dioxide (CO₂) and methane, which can be used for generating energy or running a vehicle. The residual sludge is used as a soil fertiliser. The change will help the government reach its targets on cutting greenhouse gas emissions. 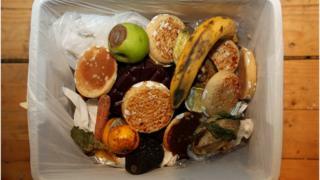 Some local councils say there’s a long-term bonus from having food waste separated and collecting it every week. Because when rotting food is safely in the caddy, general waste collections can be reduced to every two or more weeks without providing a feast for flies. The policy has been controversial for people wanting bins emptied every week. Some councils say the scheme is too expensive. It creates a problem with disposing of nappies and the food waste caddies create extra clutter for front gardens or streets. But the plan does fit with the government strategy of changing our relationship with the stuff we throw away. Recyclenow, the government-backed campaign, says: "Throwing away food is a huge waste of the energy, water and packaging used in its production, transportation and storage.